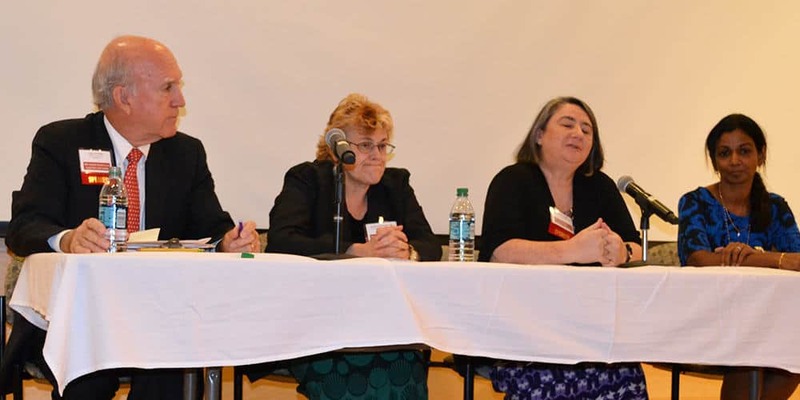 A four-person panel of experts discussed the medical and legal aspects of impaired driving at the Geriatric Update. The panel included Little Rock District Court Judge Vic Fleming, left; Germaine Odenheimer, M.D. ; Lou Ann Eads, M.D. ; and Masil George, M.D. Oct. 3, 2017 | Oct. 3, 2017 | It’s a subject that Germaine Odenheimer, M.D., finds harder to talk about to patients than having a terminal illness: impaired driving, and that’s what she wanted to speak about to the audience at the 18th annual Geriatric Update and Long-term Care Conference held at UAMS. 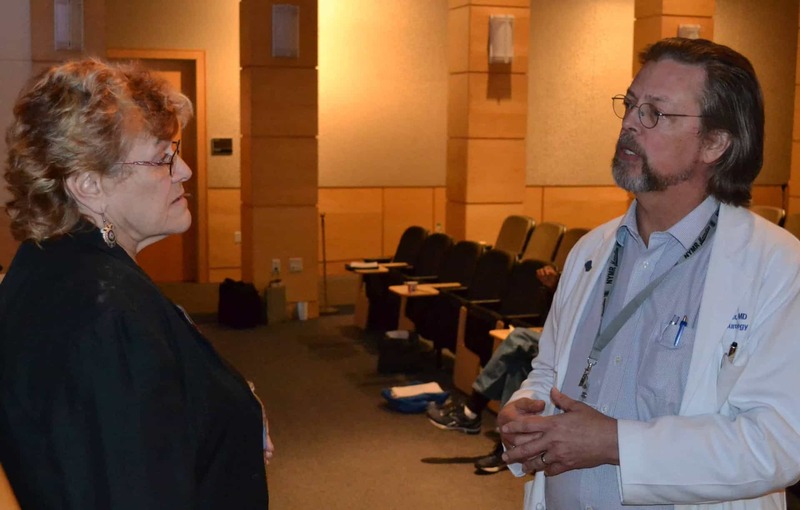 Odenheimer, left, a guest speaker at the conference, talks during a break with Mark Pippenger, M.D. Odenheimer, an associate professor in the Donald W. Reynolds Department of Geriatric Medicine at the University of Oklahoma’s College of Medicine, was a guest speaker at the conference held from Sept. 21-23 at the UAMS Donald W. Reynolds Institute on Aging. Throughout the three days, speakers, presentations and expert panels covered a range of topics from trauma in the elderly, infection control and food disparities to legal and social issues in geriatric care. More than 120 people attended the conference, which was sponsored by the Arkansas Geriatric Education Collaborative at UAMS. The conference has been supported annually by Jeanne Wei, M.D., Ph.D., executive director of the Reynolds Institute and chair of the Donald W. Reynolds Department of Geriatrics in the UAMS College of Medicine, to provide the latest information to physicians and other health professionals, as well as caregivers to the aging population. Odenheimer said as young drivers mature, they progress from being high-risk drivers with a high fatal crash rate to lower-risk experienced drivers through early and middle adulthood. Drawing further on vehicle collision data, she said the crash rate doesn’t increase again until age 75 when it starts slowly and steadily rises again. At 85 and older, it exceeds the fatal crash risk for teenagers. In almost every state, the driver is held responsible for accidents that occur when driving is impaired. But several years ago, the American Medical Association determined that physicians need to play a role in deciding when a patient is fit to drive or not and even have an ethical obligation to do so, Odenheimer said. Odenheimer said a physician can refer the patient to an occupational therapist for evaluation. In some cases, a change in medication, treating an underlying condition that is contributing or causing the impairment or limiting the patient’s driving can be enough to resolve the impairment or reduce the risk. Following Odenheimer’s presentation, she also took part in a four-person panel discussion on the topic that included Little Rock District Court Judge Vic Fleming, who oversees a traffic court; Lou Ann Eads, M.D., a geriatric psychiatrist at the UAMS Psychiatric Research Institute; and Masil George, M.D., a geriatrician and pain management specialist at the Reynolds Institute. As part of the panel, Fleming reviewed the legal processes that can be used to determine whether or not someone’s driving is impaired and unsafe. He said he too had to work through the issue with a family relative, who passed a driving test and then had three car accidents in two years. In dialogue with members of the audience, the panel engaged in an in-depth discussion of the role physicians play in helping patients and families wrestle with the issue of impaired driving. Eleven geriatrics research posters also were on display at the conference. A number attended from out of state, including some who have participated for as many as 13 consecutive years.